Each chair has a solid wood construction, followed by a beautifully comfortable, upholstered seat and back rest. 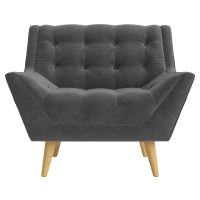 A tub chair would make a perfect addition for grandpa's sitting room as an armchair, they also make a great bedroom chair in a new nursery or master bedroom to drape over tomorrow's work clothes. Accent buttons, wooden legs, studs, exotic fabrics, patterns and deep colours all work to create unique designer pieces. Each of our items is constructed with their true purpose in mind. A chair is for sitting, but it is also an important part of a family home, business or even a waiting room.